I am a big fan of vanilla. The only scented body or hand soap I'll use willingly is vanilla, the only kind of scent or perfume I've ever used is vanilla, and just opening a jar of vanilla extract (real, please, not imitation) in another room is a great way to get me rushing in to look over your shoulder. I think it's unfortunate that the word "vanilla" has come to mean "plain" to so many minds, because true vanilla is anything but plain. Consider that vanilla is the seed pod of a tropical climbing orchid, and "plain" starts to go out the window. Vanilla Sugar is not a cheap product to make and have on hand, but I think it's worth the occasional splurge because of the way it elevates sweet baked goods. 1. Pour sugar into a bowl and set aside. Slice the vanilla bean down the center to open it. Scrape the inside of the bean with the side of a small knife to remove the seeds. 2. Add seeds to the bowl of sugar, and use your fingers to rub the inside of the scraped bean with some of the sugar, to coax out any additional seeds that you may have missed while scraping. Stir together seeds and sugar to get the seeds as well mixed as possible. 3. Pour sugar and seed mixture into an airtight container, burying the bean in the sugar as well. It will take 1-2 weeks for the flavouring to infuse fully. Robyn's notes: once the vanilla sugar has combined, it can be used in place of sugar in sweet recipes, without needing to adjust measurements. It's also good in coffee or tea, sprinkled on oatmeal or fruit, or as a simple but elegant gift-in-a-jar for friends who bake. To make this more cost-efficient, used beans work fine, too. If you've made a custard or sauce with a vanilla bean, you won't be eating the actual bean as part of that dish. So once you've removed the bean from its previous use, pat it dry gently and put it into the sugar. As the bean dries in the sugar, give the canister a shake from time to time, it'll break up any clumps that may have formed and help loosen any remaining "vanilla caviar" (the seeds) that may still be in the bean. In the photo above, I used half of a new bean and half a bean that had already been used for another purpose. 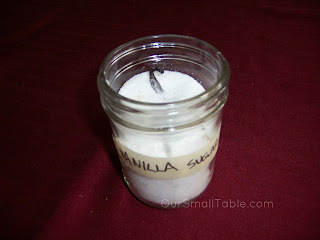 Vanilla sugar can be stored indefinitely in an air-tight container, just as regular sugar can, and just needs to be topped off with additional sugar and more seeds or another bean as you use it up.